When the McGee family, moved to Monterey Peninsula they sought out a church home and became faithful working members of the Victory Temple COGIC, under the pastoral leadership of Bishop S. R. Martin. Pastor McGee remained there until he received and accepted the call of the Lord to become a Pastor. As the founding pastor of the Emmanuel COGIC, Elder McGee, required the guidance and direction of the Lord. As he yielded to the calling God placed on his life he submitted himself to the Lord with much fasting and praying that the right decisions would be made. As Pastor McGee sought the Lord for a location, he relied on Hebrew 11:1 “Now faith is the substance of things hoped for and the evidence of things not seen”. Pastor McGee continued in fasting and prayer to God and encouraging himself. The Lord directed Pastor McGee to Reverend Johnson, pastor of Bethel Missionary Baptist Church. They were in the process of relocating the church to its current location, Elm Avenue and Imperial Street, Seaside, CA. Reverend Johnson put him in contact with the property owner of Emmanuel COGIC first location, on the corner of San Lucas and Broadway. July 1959, the little building on the corner of at San Lucas and Broadway, became the location of the Emmanuel COGIC COGIC. The building was neither grand nor pleasing to the eye, but Pastor McGee felt the he had the Lord’s approval. The name EMMANUEL COGIC meaning “God with us” was given to him by God. 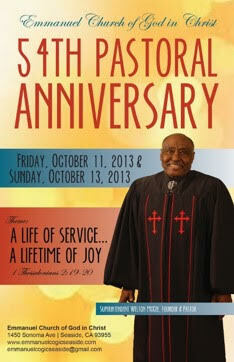 From that time until the present the presence of the Lord has been with the Emmanuel COGIC COGIC, Seaside, CA. The church continued to grow as the Lord added to the church as should be saved. With the continued growth, a larger building was needed. Under the leading of the Lord, Pastor McGee began to look for a larger building. By the divine leading of God, the Emmanuel COGIC was able to relocate to its present location, in the “Little White Church”, which was being vacated by Four Square Gospel Ministry. February 1964, 5 ½ months after its beginning, the Emmanuel COGIC COCIG relocated to 1450 Sonoma Avenue. With the passing of time, the little white church began to deteriorate. Its gleam and splendor were gone, the building became an eye sore in the community. The Lord was sought on the matter and He heard cry of the pastor and members. After years of toiling, July 1989, Emmanuel COGIC COGIC entered into the construction project of the current edifice, with the Lord as master contractor and architect. November 2, 1989, the building that housed the Emmanuel COGIC Church Family for 25 years and 4 months was demolished. During the construction process, which was a pivotal point for the Emmanuel COGIC Church family, Pastor H.H. Lusk, pastor of the Bethel Missionary Baptist Church, was able to provide a facility in which fellowship could continue. The Emmanuel COGIC Church family gives much reverence and respect to this great leader for the compassion he had on our congregation during our time of need. His graciousness shall not be forgotten. May 19, 1991, one year and ten months after the construction began, we were able to return to the new building, which now is home for the Emmanuel COGIC. Seventeen years later, March 2008, because of the faithfulness of God, diligence of the members, financial institutions that had faith in our cause, donation from friends, community sponsors and much prayer... the new home of the Emmanuel COGIC was paid in full. After the church was established, not many weeks went by before the Lord began to add to the church daily such as should be saved: Fay Coleman, and family; Brother Elam the first deacon; Sister Mary Lou Brooks, whose husband was later saved, filled with the Holy Ghost and called to preach the Gospel all in the same night. Sister Sarah King, the third Church Mother, who had many times passed the church, was directed to Emmanuel COGIC. Her son David wore a patch over his eye at the time, after being prayed for three times the patch was removed. Mother Anne McGee, the pastor’s mother, while visiting had prayer daily and other members were added to the church as the result of the daily prayer meeting. To name a few; Sister Betty Eoff and Family; The Smart Family; The Addison Family; Sister Margie Green and Family; Edward White and Family; Oliver Holmes and Family, Mother Virginia Dawson, the first appointed Church Mother; Samuel Gaskin and Family; Mother Brown, Sister Teresa Garrard and Family, The Littlejohns; The Days; Charlie Beaver and wife Willie Beaver. In 1965, Elder Beaver was called home to be with the Lord, he left the theme with us “let the redeemed of the Lord say so”. There have been many years of drought and struggle but the Lord has greatly blessed and honored Pastor McGee’s request: “Lord send souls to be fed even if you send them on their way”. The Lord has truly done that, many friendships have been made, many souls saved and many members have passed through this fellowship. Many great leaders, pastors, teachers, preachers, missionaries, district, state and national workers began their work for the Lord as a part of the Emmanuel COGIC, Seaside family. In 2013, Pastor McGee passed the vision of the Emmanuel COGIC to Elder Eugene B. Jones, a faithful member of the ministry and a blessed preacher who was raised up under Pastor McGee. Pastor McGee’s legacy will be upheld as God continues to be Faithful to this ministry and all generations that have come through.